(Reuters) - Facebook Inc Chief Executive Officer Mark Zuckerberg said on Tuesday he will host a series of public discussions about the future of technology in society as part of his personal challenge this year. Zuckerberg sounded his plan in a Facebook post, which has been a regular feature when he airs his New Year's resolutions that in the past have included personal goals such as learning Mandarin to reading two books a month. "Every few weeks I'll talk with leaders, experts, and people in our community from different fields and I'll try different formats to keep it interesting. 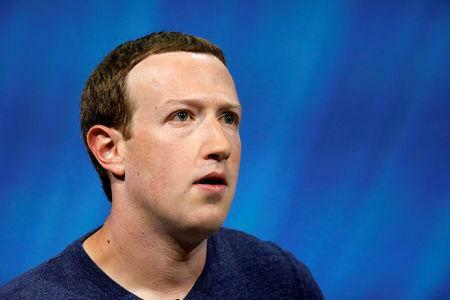 These will all be public, either on my Facebook or Instagram pages or on other media", Zuckerberg said in a Facebook post https://www.facebook.com/zuck/posts/10106021347128881. Facebook's reputation suffered last year from a data scandal involving a British political consulting firm that involved personal information of millions of users, putting the social network under tight scrutiny across the globe. Last year Zuckerberg said he would fix many of Facebook's issues such as the use of the platform for hate speech, spreading misinformation and political meddling.